I spent the day at home, partly because I wasn’t feeling well and partly to ease Boo’s transition to my wife and I both being gone during the day. I’ve been spending a lot of the past few days with the other pets (who are sleeping around me in a circle now) while my wife stays with Boo, so it was a good chance for some one-on-one time. Boo curled up on my chest as we slept through the morning, then in the afternoon as I set him on the couch to take a picture, he instead curled up beside me with his head against mine, purring loudly. The purring suddenly stopped and I surmised he had fallen asleep, so I eased back to take his picture. 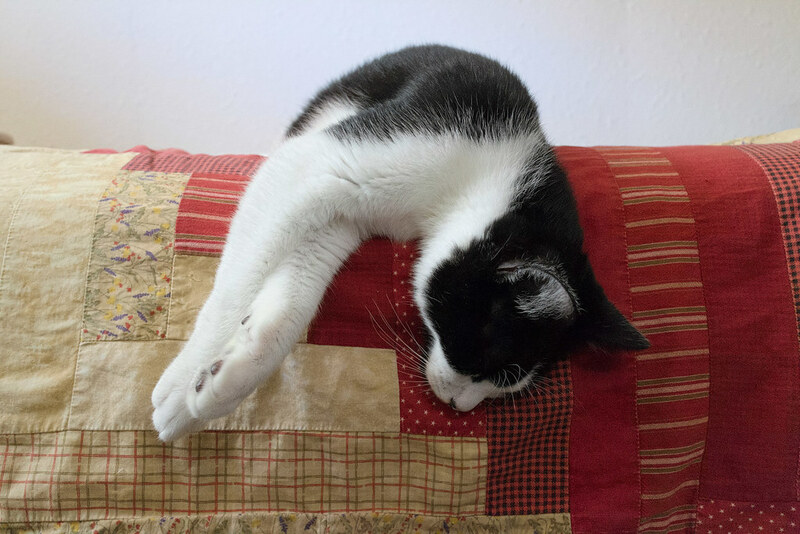 He flopped halfway over the edge, opened his eyes for a moment, and promptly fell back asleep. We had a nice day, Boo and I, even if we slept through much of it. I was sitting on the floor this afternoon when Boo came over unprompted and crawled into my lap and fell asleep. 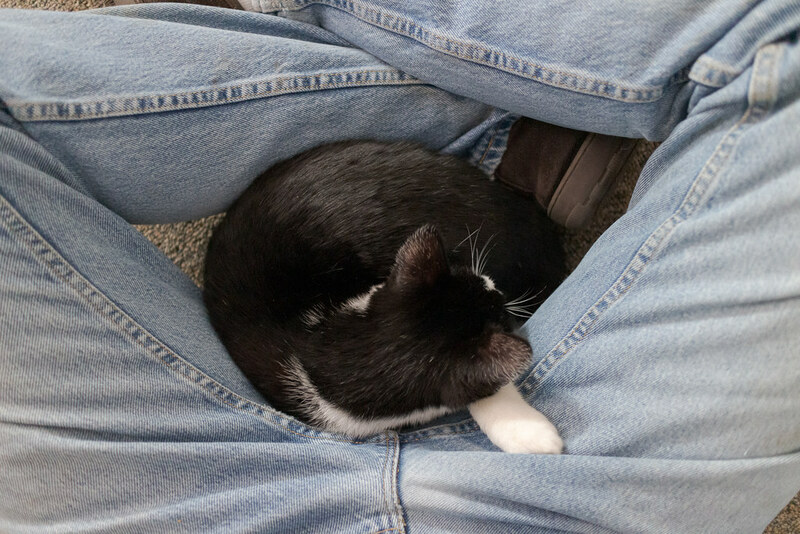 I wasn’t prepared for it and not sitting in a comfortable place, but I let him stay as long as he wanted. He’s still pretty skittish but the transformation he’s undergone in a few days is incredible. There’s a downside to this. 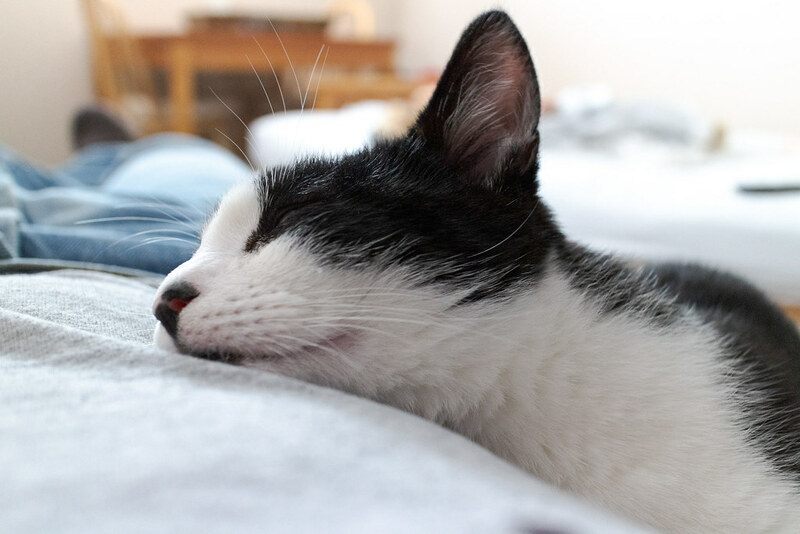 I’ve been sleeping in the bedroom so Sam can keep his routine of sleeping on me, while my wife is sleeping in the basement with Boo, who kept her up most of the night showering her with affection. 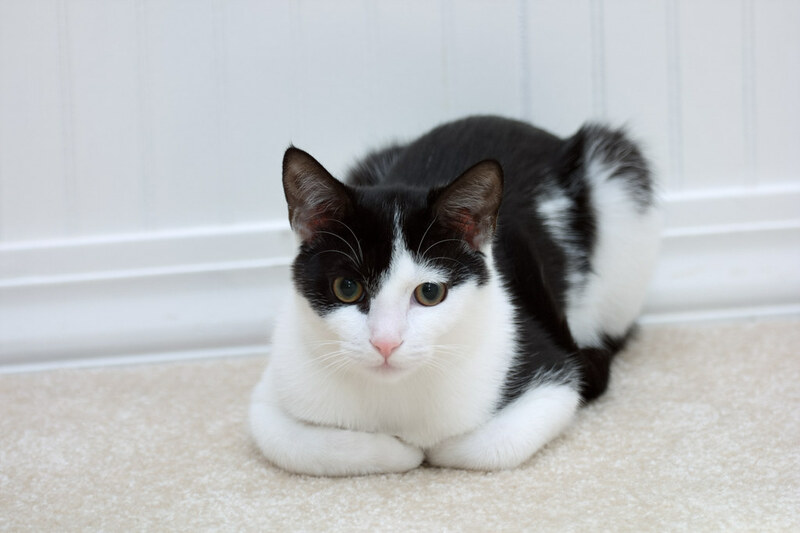 Meet the newest member of our family, a seven-month-old kitten named Boo. I thought it most likely we would adopt one of the many impossibly cute two-month-old kittens at the Oregon Humane Society as it seemed like it would have the best odds of integrating with our other pets. 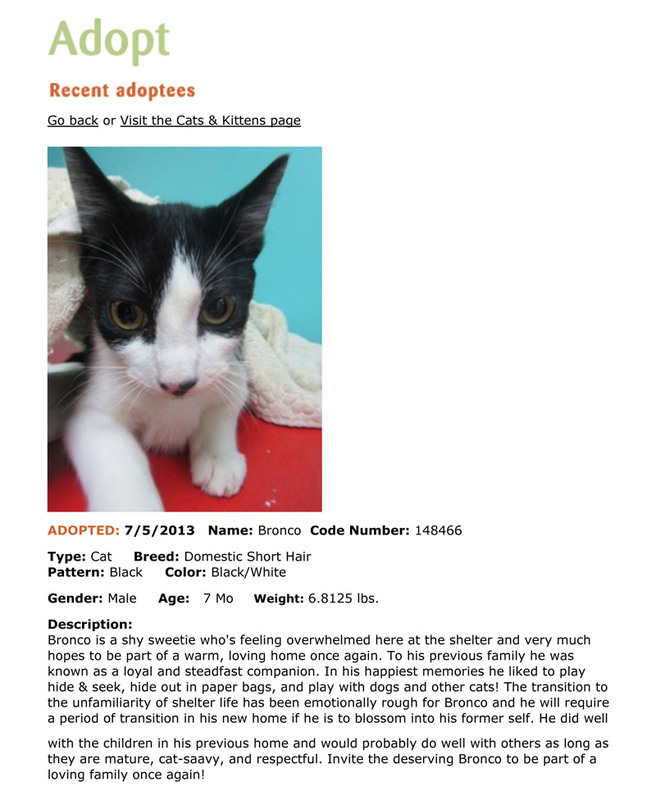 But my wife found an older kitten named Bronco who had been at the shelter for a couple of weeks but was struggling with life there. His previous owners said he got along with cats and dogs so she went down Wednesday evening before OHS closed to meet him. He was extremely shy and shook like a leaf when she met him, but eventually he warmed up to her and she wanted me to meet him. OHS was closed on Thursday for the 4th of July but we went down first thing on Friday morning. He shook at first too when I met him but then warmed up much quicker than I expected and soon was walking in and out of my lap and purring loudly. It was settled. He was coming home with us, and getting a new name. I didn’t try for pictures yesterday since it was such a stressful day for the poor little fellow but in the meantime his confidence has grown by leaps and bounds. 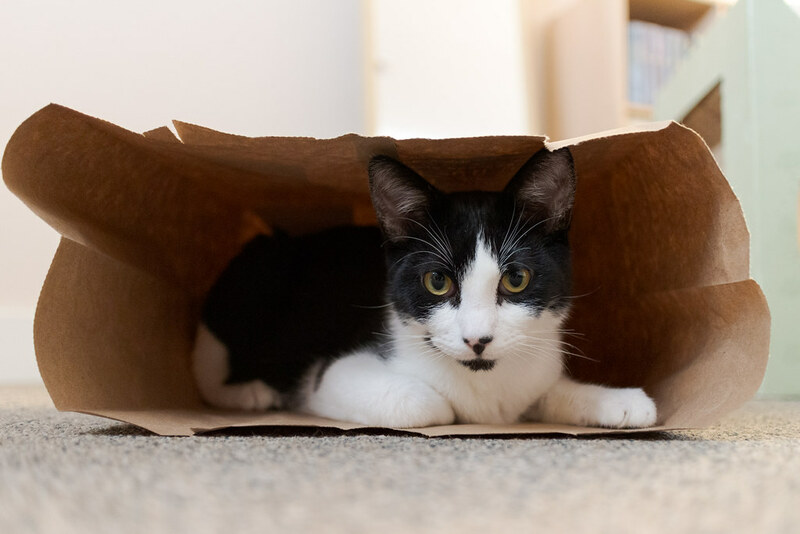 Plus a new camera arrived this morning that is much less obtrusive and he was happy enough to be my first test subject, pausing for a brief moment while playing in a paper bag. As with Scout, Boo takes his name from Harper Lee’s “To Kill a Mockingbird”. At the end of the book, Boo and Scout share a moment that is one of my favorites in all of literature. Our Boo and Scout never met as Boo joins us five months after her death. Their coloring is similar but that wasn’t a deliberate choice (that’s Boo above, Scout at a similar age below). The timing worked out nicely as a few weeks ago the similarity would have been too much for me to bear. So welcome, Boo. You’re home now.